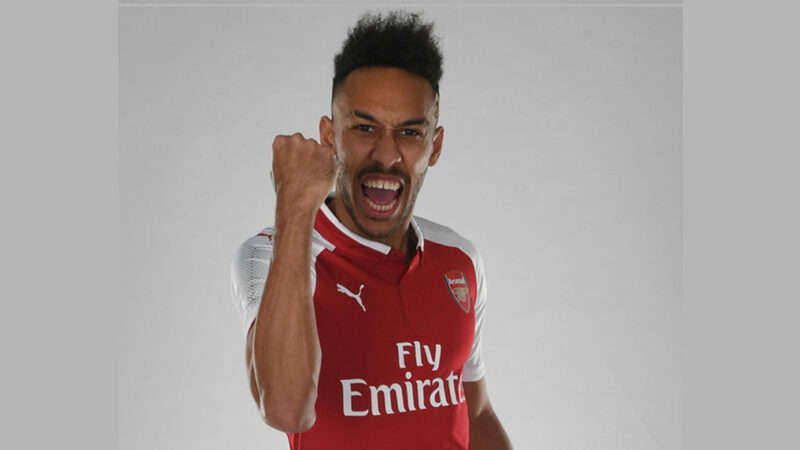 Pierre-Emerick Aubameyang has joined Arsenal after the Gunners agreed terms with his former team Borussia Dortmund, both clubs confirmed Wednesday, January 31, 2018. / AFP PHOTO / dpa / Bernd Thissen / Germany OUT Pierre-Emerick Aubameyang has joined Arsenal for a record fee for the Gunners, a reported £56 million ($79.2 million, 63.7 million euros), from Bundesliga outfit Borussia Dortmund, both clubs confirmed Wednesday.The 28-year-old Gabon striker, who has scored 141 goals for Dortmund since joining in 2013, signed a long-term contract with the storied London club. The club described him as “one of the world’s most highly-rated strikers”. “He scored 98 goals in 144 Bundesliga games for Dortmund and had a hand in 172 goals in 213 matches in all competitions for his former club,” it continued.